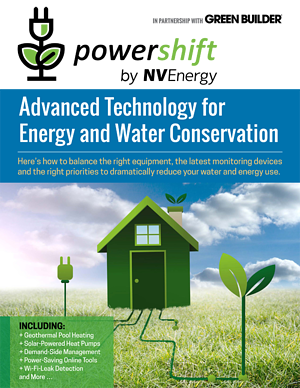 Green Builder Media announces new ebook on advanced tech for energy and water conservation. Welcome to the definitive guide to balancing the right equipment, the latest monitoring devices and the right priorities to dramatically reduce water and energy use in homes. This free Ebook also delves into the role of occupant behavior on the efficiency of a house, and how technology can help people live more efficiently in their homes without undue sacrifice. Using a green building pyramid to show the important efficiency issues to tackle first, the ebook lists all the important decisions affecting a home’s long-term energy and water use. This truly is the only resource you need to get updated on the latest tech for today’s most efficient homes.